Phillips Murrah Director Janet Hendrick mentioned in Power Players: Women Leading in Law - Phillips Murrah P.C. Phillips Murrah Director and employment attorney Janet A. Hendrick was mentioned in the October edition of Power Players: Women Leading in Law newsletter, published by University of Texas at Austin School of Law‘s Center for Women in Law. The mention was regarding Janet’s move to Phillips Murrah’s Dallas office. Janet is deeply committed to the advancement of women in the legal profession. She has been an active member of the National Association of Women Lawyers and the Dallas Women Lawyers Association, and is a thought leader and sought-after speaker on gender diversity in the legal profession. 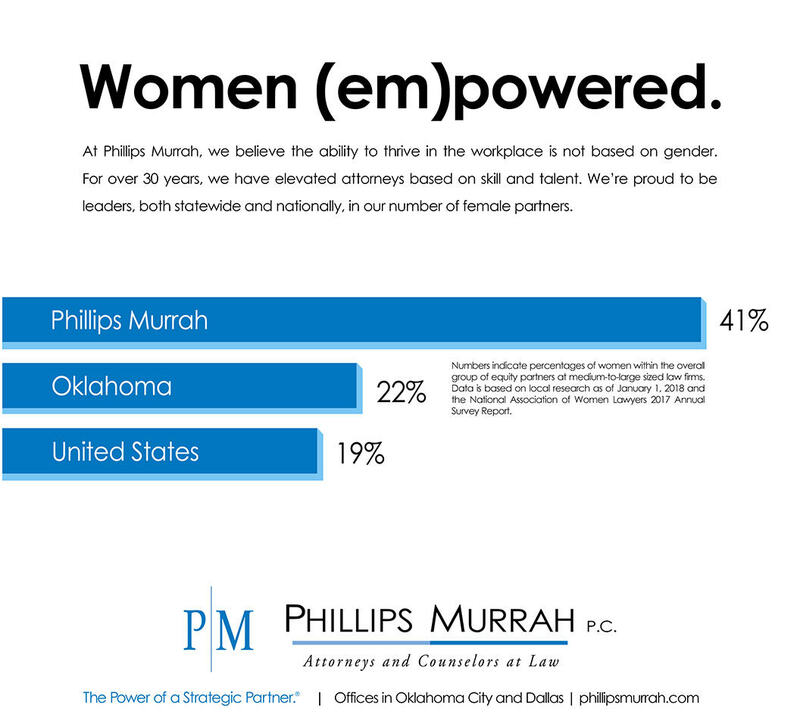 With the addition of Janet, over 40 percent of Phillips Murrah’s Directors are women, more than twice the national average for large law firms. A significant number of women fill leadership roles at the Firm, including three of the four positions on the Executive Committee.